A reimagining of the world-famous Indian epic, the Mahabharat told from the point of view of an amazing woman. 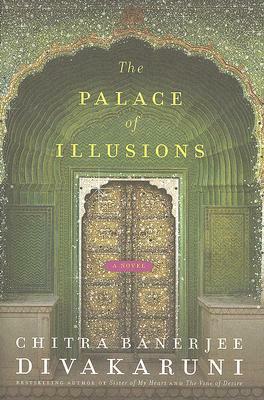 Relevant to today's war-torn world, The Palace of Illusions takes us back to a time that is half history, half myth, and wholly magical. Narrated by Panchaali, the wife of the legendary Pandavas brothers in the Mahabharat, the novel gives us a new interpretation of this ancient tale. The novel traces the princess Panchaali's life, beginning with her birth in fire and following her spirited balancing act as a woman with five husbands who have been cheated out of their father's kingdom. Panchaali is swept into their quest to reclaim their birthright, remaining at their side through years of exile and a terrible civil war involving all the important kings of India. Meanwhile, we never lose sight of her strategic duels with her mother-in-law, her complicated friendship withthe enigmatic Krishna, or her secretattraction tothe mysteriousman who is her husbands'most dangerousenemy. Panchaali is a fiery female redefining for us a world of warriors, gods, and the ever-manipulating hands of fate. CHITRA BANERJEE DIVAKARUNI is the author of the bestselling novels Queen of Dreams, Mistress of Spices, Sister of My Heart, and The Vine of Desire, and of the prizewinning story collections Arranged Marriage and The Unknown Errors of Our Lives. She lives in Houston, Texas, and teaches creative writing at the University of Houston.